Beverly Hills – The following is being sent to you to explain new evidence that has been inserted into the public Record explaining the reason for the homicide investigation, including time line and the motivations. Jeannie Kasem Appears in Court Today at Hearing for Last Will and will appear in Press Conference with her lawyers outside Stanley Mosk Courthouse 111 N. Hill St. LA after 9:30 AM. The scam was initiated on September 12, 2013, when Julie Kasem-Aboulhosn arrived at Casey and Jeannie’s home and began yelling about the Will and money. Soon after she left, several false allegations were made to the APS and LAPD, who were repeatedly dispatched to investigate allegations of “elder abuse” at Casey and Jeannie’s home. No evidence of the allegations were ever found to be true. Then, a vicious character assassination media campaign began against Casey’s wife of 34 years Jeannie and their daughter Liberty. On September 26, 2013, Casey’s ex-wife and her husband Robert Naylor, a lobbyist and attorney, were foreclosed upon in Sacramento, CA, per public records. Clearly, they were in financial distress and the 40 year post-divorce hostilities heightened. October 1, 2013, Casey’s ex-wife Linda Naylor with daughters Kerri and Julie, were amongst the Scientologists demonstrators outside of Casey and Jeannie’s home in Los Angeles. October 7, 2013, Casey’s adult children with Linda Naylor (1972 -1977) Kasem sisters Kerri and Julie, along with their brother Mike and Jamil Anis Aboulhosn, (Julie’s husband), filed a Petition for Guardianship of the radio star in Los Angeles Superior Court using a Durable Power of Attorney suspiciously signed at a UPS Store in 2007. This DPA was actively concealed for 6 years and named only themselves as agents for Casey Kasem. The following day, Sam Ingham, an attorney who has been on the L.A. court’s Probate Volunteer Panel (PVP) since 1985, was appointed by the court to be Casey’s so-called lawyer. October 11, 2013, at Casey and Ingham’s first and only meeting, Casey told Ingham that he did not want or need his representation. Ingham never contacted the attorney in Novato, CA, James D. Rush, who purportedly prepared the suspect DPA that was signed on veteran’s day, November 11, 2007 at a UPS store on Hollywood Blvd, while Casey was recovering from surgery, under medications and impaired. According to his billing records, Ingham never reviewed the merits of the suspect 2007 UPS Durable Power of Attorney. Ingham never contacted the notary who notarized it. The notary confirmed this fact to Jean’s attorneys Adrian Sawyer and Frank Busch, who took her deposition. So what was Ingham doing for “his client” between October 15 and November 19 in 2013? A batch of his emails of 2013 and 2014 filed in LASC Santa Monica court last week are beginning to reveal the conspiracy that was really going on behind-the-scenes. A few days after the Guardianship attempt of Casey was “denied for no good cause,” Troy Martin heard of the case in the media and solicited his former client Catherine Falk to recommend him as counsel for Kasem sisters, Kerri and Julie. A meeting took place and Martin was informed by the sisters of the $2.1 million life insurance policy insuring the life of Casey Kasem. He told them he would wait to collect his legal fees when Casey was dead. At this point, Martin became an accomplice in the Guardianship scams of Casey Kasem. December 3, 2013, step-father Robert Naylor formed a 501-C3 corporation which is being used by him and the Kasem sisters to masquerade as “elder abuse” advocates. This “non-profit” was created only 2 weeks after Casey Kasem was found to be receiving “excellent care” by the APS, LAPD, court investigators and Judge Green. The scam is simple, pass off Casey’s likeness as a victim to raise money, while targeting and slandering his wife Jean with false allegations of abuse. The case was finally “denied with prejudice” by Judge Green and closed on January 14, 2014. However, only a few hours after court, Ingham emailed opposing counsel, inciting another fraudulent Guardianship Petition of Casey be filed, “for what it’s worth,” his email reads. After Jeannie was vindicated of the false allegations and public scandal that the Kasem sisters maliciously initiated for their deep-seeded hatred of a woman Casey loved for so many decades, it was calm for a short while and she was able to peacefully continue caring for her husband. When the Kasem sister’s suspect 2007 UPS DPA was rendered null and void in court on November 19, 2013, their premediated scheme to file and use it at the opportune time, failed. So they started in again, with the same systematic pattern of terror. April 27, 2014, Casey’s ex-wife Linda Naylor and husband Robert Naylor with step-daughters Kerri and Julie, were amongst the Scientologists demonstrators outside the Berkley East Convalescent Hospital, exposing the private whereabouts of Casey to the public and the media. May 7, 2014, the second corrupt Guardianship of Casey Kasem was filed by the Kasem sisters and their attorney Troy Martin. APS and LAPD were called with fraudulent allegations of “elder abuse” and again, found the allegations to be false. May 9, 2014, the scheme to appoint a Guardian of Casey to defraud him and his wife out of millions of dollars, was already being planned behind-the-scenes between Ingham and Martin. PVP attorney Sam Ingham wrote an email to opposing counsel Troy Martin, “I am in the process of preparing a report that will recommend your Petition for Temporary be granted.” This email communication and conspiracy with opposing counsel was three days prior to the first hearing on the second corrupt Guardianship of Casey Kasem. Casey, Jeannie and Liberty were in Washington State while this scheme in Los Angeles was unfolding. May 12, 2014, at the first hearing (LASC Case No. BP151879), no investigation was conducted to find the “clear and convincing” evidence legally required for a Guardian of any person to be appointed by a Judge. LASC presiding Judge Daniel Murphy appointed Kerri Kasem “temporary” Guardian of Casey within 5 minutes of this first hearing. This explains why Casey and Jeannie never had a chance. 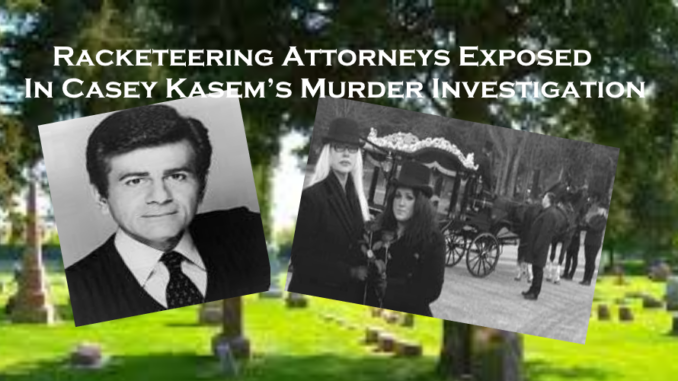 May 13, 2014, the Kasem sisters appeared on CNN and then filed a false nationwide Missing Persons Report of Casey Kasem the next day as a publicity stunt, recklessly wasting law enforcement time and taxpayer dollars. May 15, 2014, Washington Deputy Sheriff Scott Wilson held a press conference stating that Casey was not a Missing Person and was with family doing fine and the Kitsap County Sheriff’s Office closed their investigation. Ingham continued to work with opposing counsel Martin to hire an attorney in Washington State to export and register the “temporary” Guardianship papers that were fraudulently obtained in Los Angeles. Ingham found Washington attorney Scott Winship and told him that if he joined them, he could invoice his legal fees against Casey’s estate when he is dead. May 21, 2014, Casey’s Washington attorneys, his personal physician Donald Sharman, MD and his daughter Liberty also held a press conference in Poulsbo, WA, publically stating that Casey was not a Missing Person and was being well cared for. May 30, 2014, at the first hearing (Kitsap County Superior Court (KCSC) Case No. 14-4-00374-8), Scott Winship and Kerri Kasem perpetrated interstate fraud on the court by filing the fraudulent California Guardianship papers in Washington. Winship and Kerri deceived Judge Jennifer Forbes about Casey’s medical condition and into allowing them to forcibly take Casey to St Anthony Hospital for a supposed “independent” medical evaluation. Jeannie offered that a doctor make a house call instead of distressing Casey by taking him to a hospital. The Judge ordered that Casey was to remain in the jurisdiction of Washington, with the exception that only Jeannie could return her husband to California. The Judge also ordered that Julie could not be a “stand-in” for her sister Kerri. June 1, 2014, Scott Winship and Kerri Kasem took Casey against his will to St Anthony Hospital in Pierce County, WA, which was in another county from where he was staying with his wife Jeannie and their daughter Liberty in Silverdale, WA. Casey’s personal physician, Dr. Donald Sharman attended the medical evaluation performed by Dr. Joseph Regimbal, who praised Dr. Sharman’s care and cleared Casey to return back to his care that afternoon. After examining Casey, Dr. Regimbal concluded that “Casey had been receiving appropriate medical care prior to his arrival at St Anthony Hospital and that Casey was stable and could return home to the care he was receiving.” In Dr. Regimbal’s report, he wrote, “His [Casey’s] current care plan and management in his current home, has been appropriate today, Dr. Sharman’s recommendations and availability have been excellent and timely.” Dr. Sharman concurred with Dr. Regimbal’s recommendation that Casey return home. Winship’s paralegal Mary Regimbal is married to Dr. Joseph Regimbal, the doctor who examined Casey at St Anthony Hospital. Kerri had left Washington and in further violation of the court order, had illegal placed her sister Julie in charge at the hospital, a Physician’s Assistant with a suspended California medical license. June 4, 2014, Washington APS came out with their report that stated Jeannie was providing “impressive care” for her husband. June 6-7, 2014, late Friday night, with no courts open, Jeannie and Liberty were called to St Anthony Hospital and shockingly informed by Nurse John Reeder that the Kasem sisters [using their nullified 2007 UPS DPA] unilaterally instructed the hospital to withhold all of Casey’s hydration, nutrition and proactive medical care to kill him. Jeannie and Liberty were only permitted 5 minutes each to say goodbye and never saw Casey alive again. June 8, 2014, Jeannie immediately flew to Los Angeles to urgently reinstate Casey’s food, water and medical care. Her emergency Motion was granted on June 9, 2014 and Ingham was ordered to fly to Washington. He never did. PVP Ingham emailed St Anthony Hospital, pretending to implement the Los Angeles court order, while he was working behind-the-scenes with opposing counsel Troy Martin, co-drafting their Motion to Vacate the Reinstatement Order that Jeannie obtained, which was vacated by Ingham and Martin on June 11, 2014. June 13, 2014, Jeannie filed a Writ of Mandamus appealing. She fought to save her husband’s life. Casey was pronounced dead that weekend. June 16, 2014, an autopsy was conducted by Dr. Eric Kiesel, consulting with Dr. Michael Baden, who have both requested law enforcement intervention. Casey’s Manner of Death is listed on his Washington State death certificate as UNDETERMINED, which is suggestive of a Homicide. Gig Harbor Police Chief, Kelly Busey, confirmed to the media that a murder investigation into the death of the beloved radio star was opened on October 29, 2018.